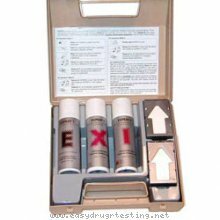 Detox products: EXPRAY Explosives Detection / Identification Field Test Kit (100 Tests). Pass drug tests, passing all drug test. This product only can be shipped in US only Expray is a unique, aerosol-based field test kit for the detection and identification of Group A explosives (e.g. TNT, TNB, etc. ), Group B explosives (e.g. Semtex H, RDX, C4, etc.) and compounds containing inorganic nitrates that are used in improvised explosives (e.g. ANFO). Expray is commonly used as a pre-blast, analytical tool, post-blast investigative tool, screen against potential terrorist elements and as a technical evaluation test in soil remediation on hazardous material "clean-up" sites. When used as a post-blast investigative tool, the product is field proven to speed up crucial investigations. The level of sensitivity (20 nanograms) surpasses that of other currently available products. The testing process is fast and efficient. No glass ampoules, spatulas or waiting period required. Results appear in seconds. No additional tools or equipment required. The identification/detection process requires no special training and testing can be performed "on the spot". For both law enforcement and investigative personnel, Expray is a proven tool for increasing the accuracy, efficiency and number of interdictions. For forensic and environmental laboratories, it has proven to reduce the number of samples submitted for testing, saving both time and money. Expray is sold in a kit configuration, which provides all three aerosol sprays, collection papers, and an RDX-impregnated verification pad (verification pad is useful for ensuring that the spraycan still contains active reagents and for demonstrating how a positive reaction will appear) in a convenient plastic carry case. Expray kits are available in both regular size (100 tests) and mini-size (50 tests). Mistral is proud to say that Expray provides a low "per test" cost and poses no risk to you or the environment "E": Expray-1 for Group A Expray-1 is used to search for GROUP A type explosives which include TNT, Tetryl, TNB, DNT, picric acid and its salts. To use, wipe suspected surface with special collector test paper. Spray with Expray-1. If a dark brown-violet color appears, this indicates the presence of TNT; An orange color indicates the presence of Tetryl and other GROUP A explosives. "X": Expray-2 for Group B Expray-2 is used to search for GROUP B type explosives which include Dynamite, Nitroglycerine, RDX, PETN, SEMTEX, Nitrocellulose and smokeless powder. If after spraying Expray-1 there is no color change, spray Expray-2. The almost immediate appearance of a pink color change indicates the presence of GROUP B explosives. Most plastic types of explosives belong to this group, including C-4 and Semtex. "I": Expray-3 for Nitrates Expray-3 is used to search for nitrate-based explosives which includes ANFO (ammonium nitrate-fuel oil), commercial and improvised explosives based on inorganic nitrates, black powder, flash powder, gun powder, potassium chlorate and nitrate, sulfur (powder), and ammonium nitrate (both fertilizer and aluminum). If there is still no reaction after using the Expray cans 1 and 2, but presence of explosives is still suspected, spray the same paper with Expray-3. A pink reaction indicates the presence of nitrates, which could be part of an improvised explosive.